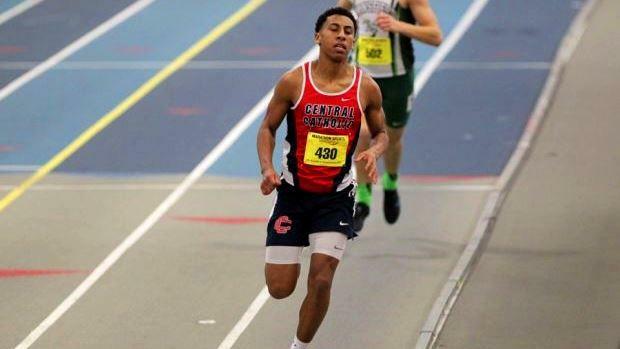 After Day 1 of the age 15-16 Decathlon, Central Catholic's Gregory Desrosiers appears to be right in the mix at the AAU Junior Olympic Games. Desrosier's is among the top five competitors after the first five events on Saturday. He captured the 400-meter dash with a time of 52.55 seconds to earn 701 points. He was also fourth in the 100m dash (11.83, 685 pts. ), fifth in the long jump (18 feet, 10 inches, 531 pts. ), eighth in the high jump (5-5, 504 pts.) and fourth in the shot put (33-6, 498 pts.). The decathlon concludes on Sunday with the pole vault, javelin, discus, 110m hurdles and 1,500m.